Imagine that your company has just come up with an amazing new product that you'd like to tell your target audience about right away. How would you go about informing all employees, investors, partners and members of the media about your new product? How can you get across the information quickly, efficiently and inexpensively? The answer would be to assemble an online news release to announce your great new product to the masses. Anyone with the correct information can produce a news release, and that news release can serve as a platform to introduce information to followers on social media, update as part of an e-mail newsletter, garner published news in blogs, magazines and newspapers and be added to the News section of your site to promote search engine optimization and provide content updates. Below, LyntonWeb outlines how easy it is to assemble your online news release. Though there are hundreds of different formats out there, most releases typically contain the same type of information. The heading of your online news release can be something as simple as a line and a logo, or can show logos for your full product lineup - it's completely up to you. 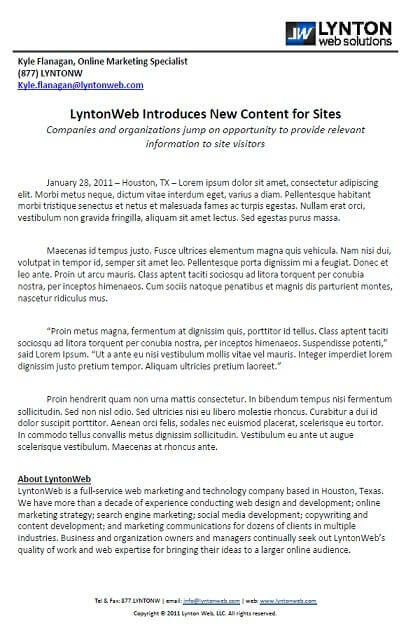 The goal of a news release is to inform, not overbear, so be careful with how much attention you give the top of your document. The main content will be located in your subject and body copy. Contact information in your online news release is important to have. Once someone has read your release and has questions or comments, whom should they contact? Some companies and organizations list out their external communications expert or public relations team, but you can list anyone that you feel is qualified to answer questions and provide direction regarding the content of the release. Typically, contact information should include a name, phone number and an e-mail address and can be located directly under your heading, as part of your heading or at the bottom of your release. One of the most important parts of your release, the subject line, tells readers what your release is all about. Attempt to summarize your news in 8-10 words, bolded, at the top-middle of your release. Try not to be too flowery with adjectives; remember, the purpose of an online news release is to inform, and if a publication or reader feels your release contains too much "marketing speech," they may stop reading your news altogether. The body copy provides your readers with all of the information you'd like them to know. The body copy of a release typically begins with the day's date followed by the location from which your information or news is originating. From there, your first paragraph should briefly summarize the information being presented, with supporting information following. To give your online news release extra validity, you can quote experts within your company or organization as they speak out about products. It's not always easy to sit down and quote someone, which is why some copywriters choose to create their own quotes then have them confirmed or edited by the person being quoted. The body copy should include keywords relevant to your audience - sticking with the car theme, you would use the name of the industry, name of the car, features, target audience for the car and anything else that may align your news with your audience's interests. You've attracted your reader and given them the scoop - now what? At the end of your release, give them some direction - visit our website for more information, or call this number to find out more. You never want to leave your readers suspended - tell them what to do, and they just may do it! The boiler plate finds its place at the very end of your news release and provides brief information on your company or organization. If someone read about the Super Car Company but had no idea who they were, the boiler plate would provide them with the information they need and is usually adapted from the "About Us" section of a website. If there is an additional company or organization involved in your news release (such as a joint venture), their boiler plate would follow yours. That wasn't so hard, was it? It takes practice to make a release newsworthy and relevant to your target audience, and LyntonWeb employs some of the best content strategists and copywriters to get the job done. If you ever have any questions about preparing a release, or where to send it once you're done, get in touch with us - we'd be happy to help!